I'm trying to understand bond yields, prices and coupons. I get the basic concepts (i.e. coupon is the interest paid in each period and prices and yields are the inverse of each other). I don't think I am interested in buying or selling bonds or speculating on which way interest rates will go; I am looking for reliable safe interest accumulation. So should I just be looking at the coupon and be done with it? I've attached a picture that shows the information I have from my bank's top Bonds performers screen. Thanks. The short answer to your question is, "yes; you should be looking at the yield." What will happen with bonds whose prices are greater than the face is that part of your interest payment will actually be a return of principal. For those below the face, part of your interest won't be paid till maturity. For example, if you paid $95,000 for a $100,000 bond, then the missing $5,000 is actually interest that you will not receive until the maturity date. In some legal jurisdictions, part of this difference will be due each year as taxes as it will be treated as taxable income. When you pay a discount, you lock in the rates more because the discount is really compound interest. When you pay a premium, you have less of a rate lock because you are getting your principal back with each and every payment of interest. You would reinvest at the new rates. Bonds guarantee the safety of principal but provide no safety of interest. That can jump around like a yo-yo. Look at the '70s and '80s for an example. With that said, bond prices will move like a yo-yo too when that is happening unless you hold the bond to maturity in which case the interim bounces don't matter. Stocks dividends guarantee the safety of income. Dividends on a broad portfolio of stocks tend to increase at the inflation rate so that a person receiving $100 per month in dividends who could buy a car for $10,000 will tend to receive $500 per month when car prices move up to $50,000. They maintain constant purchasing power at the risk of losing catastrophically if you need the principal back. The interest that is paid is a percentage of the notional amount and will be the same regardless of how much you pay for the bond. What you are paying is the present value of the principal plus the interest, so if you buy a $1,000 bond with a 10% coupon, you'll get $100 per year in interest payments, plus when the bond matures you'll get your initial $1,000 back. No, you should look at the yield. If you have two bonds with equal coupons but one has a lower price, it will have a higher yield (because you get more for your money). Keep in mind, though, that the reason you get a higher yield is because there is a higher risk of default, meaning the risk that the entity won't be able to make its interest or principal payment, and you will get less than the bond's face value. In reality, though, this risk is generally very small since it means that the entity is bankrupt. Notice in your quote screen that the yields are all fairly close but the coupons are significantly different. This is because the companies all have relatively similar credit ratings, and thus have similar default risk. The bonds with higher coupons have higher prices (and thus lower yields) because you would expect to pay more for higher coupons (all else being equal). Also, the tenor (time until maturity) is a factor. Longer-dated bonds will usually have higher yields because you are tying your money up for longer periods of time (assuming you hold the bond until maturity). Yield-to-maturity is the total return of the bond because yield-to-maturity takes into account the redemption. Also, yield-to-maturity is usually annualized even though the difference between the bond price paid and the bond par is only settled at the redemption date. If the bond price is quoted then the yield-to-maturity is calculated. Or if the bond yield is quoted then the bond price is calculated. 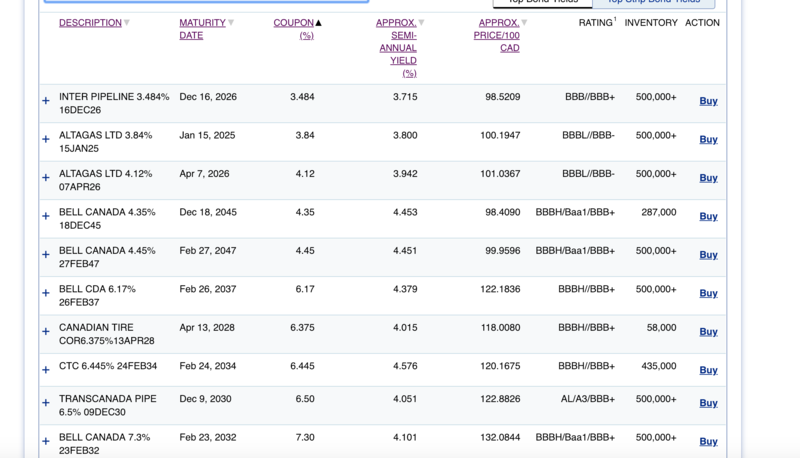 However, the current holder of the bond is due 5 months of accrued interest and that is 5/6 * 3.085 or $2.57. So I've approximately priced the bond at $118.03 + $2.57 or $120.60 . Here’s a simple way of looking at it. Coupons are calculated based on the face value of the bond. Let’s say the bond’s face value is $100. Usually, this is the principal initially invested and also the principal that will eventually be repaid. In the secondary market, the price can fluctuate. Let’s say you buy in the secondary market when the price is $110. If the bond carries a coupon of 5%pa, you’d expect to be paid $5 each year, regardless of the price on the secondary market. This annual $5 is the income component of the bond, also called coupon payments. If you hold the bond to maturity, you’d expect to get $100 back (a capital loss of $10). If you sell when the price is $120, you have a capital gain of $10. If you sell when the price is $90, you have a capital loss of $20. Your total return is made up of the income gains (coupon payments) and capital gain/loss. So if you paid $110 for a $100 face value bond that pays 5%pa coupons maturing in 3 years, and hold the bond until maturity, your total income gain is 3x$5 = $15 income and your capital loss is $110-$100 = $10. Some jurisdictions tax these separately, but you can add them up to work out your total 3-year return of $15-$10 = $5, from which you’d deduct fees and taxes to get your actual return. Note that if the bond paid coupons twice a year ($2.50 each time) and you bought halfway between payments, you’d still get $2.50 at the next coupon payment, but you’d pay the seller $1.25 to account for the accrued ‘interest’. Why is that we discount all the coupons and par amount of a bond at the same rate? How US government bonds with different face interest rates would be taxed? How do I solve this exercise with bond and probabilities?